The Thermostat Housing is designed to be mounted remotely from the engine, ideally behind and above the engine attached to some part of the aircraft's engine mount. The purpose of the thermostat housing is to handle the routing of coolant to either the Coolant Pump intake or to the radiator. 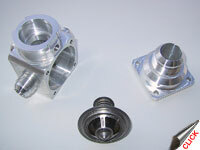 The thermostat housing contains a thermostatic valve and has fittings to connect it to the hot coolant return lines, the bypass line and the radiator outlet line. All fittings are 37º, AN type. The thermostat housing also provides the fill point of the coolant system and utilizes a 20lb pressure cap to seal and maintain coolant system pressure. An overflow port is connected to a remotely mounted expansion tank, and two ports are provided for the system temperature and pressure sensors. 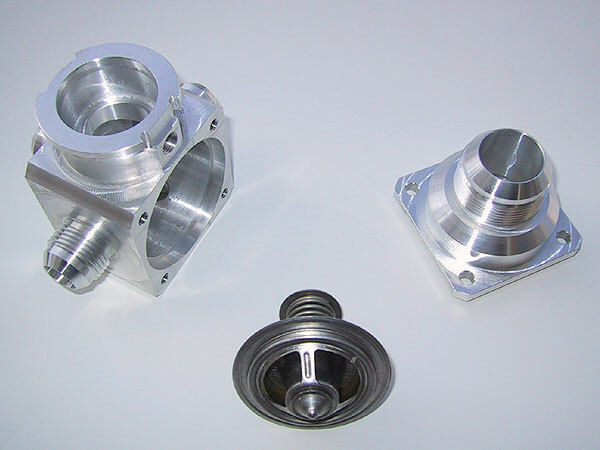 The housing itself is machined from billet, 6160-T6 hardened alloy and is anodized in a variety of colors (clear, black or blue) to provide an anticorrosive finish. The thermostat itself is an off the shelf high performance/heavy duty automotive part. We have selected a balanced sleeve design that provides maximum flow and is also unaffected by coolant flow rates and pressures.